If surprises can be this cute then who wouldn’t like to get surprised everyday? 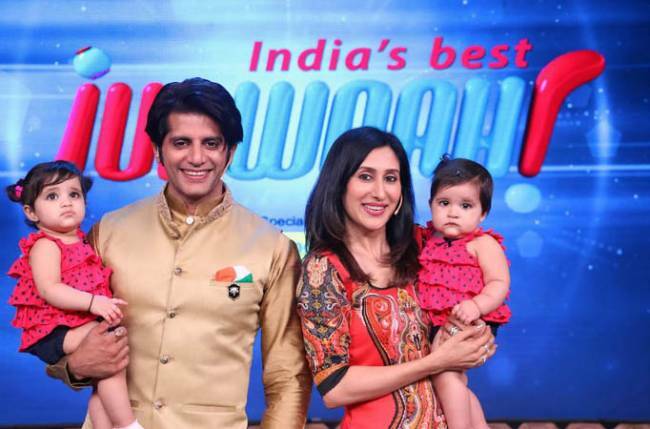 The smart and suave Karanvir Bohra was on cloud nine after seeing his wife and actor Teejay and their cute little twin daughters on the stage of Zee TV’s India’s Best Judwaah. For the upcoming Independence special episode, Karanvir’s wife Teejay surprised everyone by getting their twins to the show. She also shared how after the birth of their twin daughters, they have become more responsible and are gradually becoming more aware of how the toddlers behave and react. Checkout the pictures of the Bohra family having a great time with the India’s Best Judwaah’s team below!